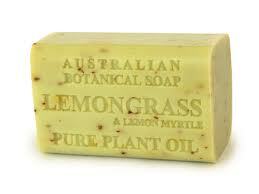 I thank my aunt for introducing me to this wonderful product from Australia: the Lemon Myrtle Soap! I love the smell of this soap, it so pleasing to the nose. She also brought some Lemon Myrtle Shampoo. The effect of these products on me is unbelievable - it makes me refreshed and energized in the morning, due to its citrus aroma. I asked her to send me some on the next package. I am so into it, not just because of its aromatherapy properties, the products from this Australian-native lemongrass are considered green cleaning products - natural and safe to use. I wish I can find one here locally while waiting for my stock to be sent.